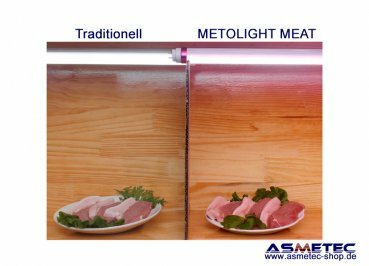 Early studies of pork suggested that surface temperature is a more important factor than exposure to light for the discoloration of pork and the growth of microorganisms on pork displays in refrigerated grocery store meat cabinets. However, the surface temperature of pork has been found to increase proportionately with the intensity of the lighting, regardless of whether the lamp is an incandescent or a cool white fluorescent lamp. 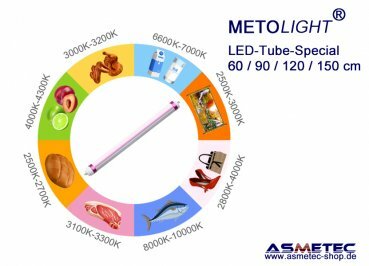 With all meat, even slight increases in surface temperatures accelerate oxidation and allow bacteria to grow exponentially, causing the meat to turn brown and to decompose. Later studies have shown that even with the lower levels of myoglobin in pork as compared to beef, pork is still sensitive to the oxidizing effects of light and will become discolored, turning brown or grey, after prolonged exposure to light and UV radiation, impacting sales even though this color change is not as dramatic as it is in cuts of beef. Pork color is the most critical deciding factor for consumers when they select pork cuts from supermarket meat display cases. Fresh pork is optimally pink. Studies have found that pork shelf life is limited more by the development of a brown or grey color, which develops long before the meat has spoiled, than by any other factor. For pork, this discoloration is accelerated by increased surface temperatures which can result from using meat display lighting that emits large quantities of UV and harmful visible spectrum radiation. These increased temperatures can also cause pork fat to become rancid. In this case, P pink which less pink than RBW type and is closer to the meat color. 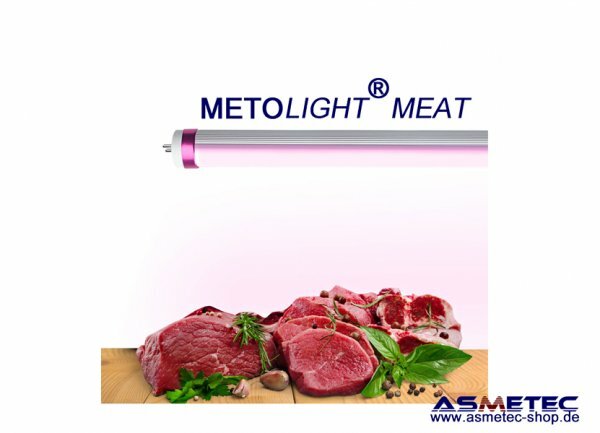 It makes the pork more natural, as well as reduces the meat discoloration.